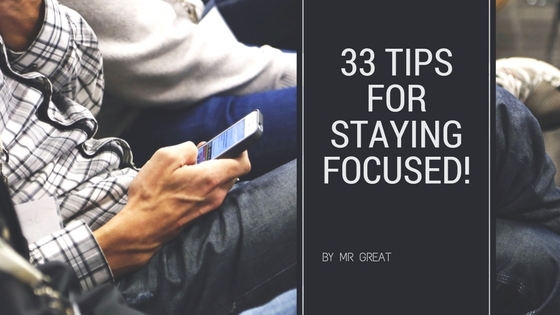 33 Tips for Staying Focused! Tip Number 1: Make a checklist. Checklists show you where you are, how much you have progressed, and what still needs to be done in order to achieve your goal. Even if you suddenly fall sick and have to leave the office for a week, the moment you get back your all-important checklist will be enough to bring you up to speed. Tip Number 2: Set a schedule. The quickest way to reaching your goal is to create a schedule for it – and stick to it. How many hours each day can you truly set aside for reaching your goal? What part of the day is the best time to work on reaching your goal? A schedule also means having a specific place for you to do your work. Choose something that will benefit the kind of work that you are doing and the kind of person you are. Will something peaceful and quiet work more for you or do you prefer to be working outdoors and surrounded by sounds of nature? Tip Number 3: Make it a habit. Tip Number 4: No excuses! Tip Number 5: If you really have to, then it is okay to negotiate the terms – but do keep your word. Tip Number 6: Eliminate distraction. Tip Number 7: Log out from all social networking and social messaging systems as well as Internet forums. If you have to, set a separate schedule for it – but this is one activity that should not be a part of your multitasking list. Tip Number 9: Take a time-out but time it! Tip Number 10: Are You Sleeping Enough? Tip Number 11: Diet matters. Tip Number 12: Exercise matters as well. Tip Number 13: Enjoy what you are doing. Tip Number 14: How about a change of pace? Focus is also dependent on pace. You may be trying to do things too fast or slow for your brain to actually enjoy what you are doing. When your pace is too punishingly fast, you are more liable to commit mistakes. In your effort to save yourself time, you are actually causing yourself to suffer greater delays since some of your tasks have to be redone or rectified. Using an excessively slow or relaxing pace is no good either. Do not overestimate your ability to work because that can ultimately develop into procrastination if you are not careful. Tip Number 15: Consider a change of setting. Sometimes, working in the same place day in and day out can get a little boring, and your mind will start to wander – relentlessly. When you have tried your best to keep your mind from wandering to no avail, then a change of setting may be in order. Look for a different place – just for a day or two – to stay when it is time to work on achieving your goal. A new place may be enough to spark your interest in your goals. It may also help get your creative juices flowing and give you an idea or two on how to better motivate yourself. Tip Number 16: Be methodical. The best way to stay focused is to be methodical. Do not choose a random point to start working toward your goal. Whatever it is you are aiming for – even if it is to improve your marriage or lose weight – there is sure to be a methodical or logical system for doing it. Taking a methodical approach helps improve your focus because it enables you to see where you are going. If you are feeling a little bored concentrating on the task at hand, you can switch your attention to making the necessary adjustments to prepare for the tasks in line. Tip Number 17: Music is --- fifty/fifty. The truth is, some people find music relaxing and helpful to their work. Others, however, find it too relaxing that they end up sleeping or they find it too entertaining that they end up forgetting all about the task at hand. You have to determine for yourself if music will serve as an aid to improving your focus or a distraction instead? Tip Number 18: It is all about what you think and feel. Well-meaning friends may encourage you to try this and that to improve focus. Certainly, there is nothing wrong with taking their words into account. Remember, however, that every person is built differently. What may work for them may not work for you. That does not mean, however, only one of you is doing the right thing. In the end, the best way to improve your focus is to do what works for you and not others. Tip Number 19: Do not be a pushover. Some people will try to sway your mind and make you feel guilty about the time you are devoting to your goal. Whatever it may be, if your goal is important to you and is not cruel or harmful to yourself or anyone, then you have all the right in the world to devote yourself to it. Tip Number 20: Do not allow emotional conflicts to get in your way. One of the worst kinds of distraction is emotional conflict. This kind of problem eats away at your concentration. If there is anything that is bothering you, resolve it right away before getting back to work. Do not allow it to fester inside you. The longer you delay resolving such conflicts, the harder a time you will have finding a way to re-open the discussion about it. Tip Number 21: Know your priorities. If you are torn between doing two things, you have to give yourself another ultimatum. Which is the more important priority – the goal you are working on or the alternative? Be brutally frank to yourself as you consider your options. If you have to choose which of the two you should lose, which of them are you willing to give up? Tip Number 22: Consider your energy patterns. This may sound a little too scientific, but rest assured that it is not. People have different energy patterns for various reasons. Some people, for instance, simply feel more energized to work in the middle of the night because there is absolutely no distraction to worry about, with everyone fast asleep. Others like to work first thing in the morning because it makes them feel productive. Their energy then wanes when it gets to lunch time but jumps back up when it is in the early evening. Try to familiarize yourself with your energy pattern. Think back on the days you were asked to complete a particular task. When are you typically more efficient in completing your work? When are you less than diligent working on your tasks? Tip Number 23: Maximize your time. Maximize your time in the sense that you should delegate what may be delegated to other capable individuals, thus allowing you to concentrate on the most critical tasks. Your focus will be ruined if you have a million things to do and yet you are worrying the most about only three of them. If this is the case, you will never get to finish anything. Do yourself a favor. Find people whom you can trust to do a part of your work and then devote yourself to doing what you feel needs the most of your attention. Tip Number 24: Chew things down into manageable pieces. Say you were given one whole cake to eat. Should you swallow it down in one bite? It would be pretty impossible to make an entire cake fit your mouth, but you can definitely eat it all if you cut it into several slices. From there, you can eat a slice of cake one bite after another. Sometimes, focusing on the bigger picture alone is not helpful. There are times when you have to forget about the bigger picture first and concentrate on one part of the picture at a time. Tip Number 25: Make allowances for mistakes. Nobody is perfect. There will be times when nothing you can do is right. It is critical that you prepare beforehand for this and make allowances for mistakes. If you can complete a task for thirty minutes, try giving yourself forty minutes instead. This way, you will not be terribly backed up if you do end up making a mistake or two. Giving yourself allowances will also prevent your mistakes from breaking your stride. You will keep going – no matter what – like an Energizer bunny! Tip Number 26: Practice memory improvement techniques. Memory and focus are intertwined in many ways. As such, improving your memory will consequently improve your ability to concentrate. There are many ways to improve your concentration. You can find free exercises online. You can also try joining a memory training workshop or read a memory enhancement book. There are also memory training software programs that you could try. Related : Everything Is Energy. Tip Number 27: Learn how to read effectively. Whether your goal is personal, work-related or something else, there will surely be a time when your goal would require you to read something. This should not be a problem, however, if you learn how to read effectively. The world’s fastest readers do not really read every word of the book or material they are reading. Rather, most speed readers are good at skimming and finding context clues. Their mind and eyes are trained to find the most important parts of each page and paragraph. Even if they have a limited amount of time to finish reading something, they will not have any problems grasping the most salient points about it. The written word is one of the most notoriously common things that many people have a hard time focusing on. You will not have to suffer the same fate if you just take the time to learn how to read effectively. Tip Number 28: Be eager to learn. No one is too smart to stop learning. You will have an easier time focusing on new topics or tasks if train yourself not to be reluctant to learn about new things. Granted, old dogs have a hard time learning new tricks, but surely you have more brain cells and willpower than canines? Knowledge is a beautiful thing, and you should not turn your back on the opportunity to learn something new if it is given to you. Tip Number 29: If you are the type and if it helps – pray. Religion is purely personal – just like goals are. If prayer matters to a lot to you, then asking for a little bit of divine intervention would not go amiss. As the Bible says, ask and ye shall receive. Other religions in the world are surely of the same mind even if they couch it in different terms. Tip Number 30: Remind yourself of the consequences. If you are extremely tempted to give up on what you are doing and just lose yourself in having fun instead, remind yourself of the possible consequences and that is sure to get you back in line. Say you want to lose weight. If you eat that extra cup of rice tonight, it would mean having to spend an extra hour in the gym tomorrow. If you fail to do that, it will mean having your weight increase by two pounds. In time, it will mean not being able to fit into that new swimsuit you so wanted to wear to the beach party you are planning to attend – which the guy of your dreams is sure to attend as well. Now ask yourself again – do you still want to stray from the task at hand? Tip Number 31: Remind yourself that you are not the only one at stake. Most of the time, the goals you want to achieve affect others as well. Say it is your aim to increase profits by 25% by the end of the year. If you do not reach your goal in time, then you will not be able to give your staff the Christmas party and end-of-the-year bonuses they so richly deserve. RELATED : Tips to Get Motivated! If you do not care about the consequences you will suffer from by losing focus, surely you are not selfish enough to ignore how your decision will impact others? Tip Number 32: Forward all calls to your voice mailbox. Phones – all types of it – are also a source of distraction. Change your answering machine’s message to let people know that you absolutely cannot afford to be disturbed. If they truly care about you, they are sure to understand. Be sure, however, to let them know that you will be checking your email inbox every hour. If they have a drastic need to contact you, then they better start typing their emails. Tip Number 33: Limit you email-checking to five minutes per hour. It really cannot be more than that because you are only supposed to reply to emails that absolutely require a response. Anything less than important should be set aside. You have to be very firm about this rule or you will end up procrastinating again.